British playwright Michael Frayn’s farce-within-a-farce Noises Off has become one of the most beloved and popular comedies since its original staging in 1982 – so popular that when Frayn updated it ten years ago for a National Theatre revival it caught a Tony for its famous Broadway transfer. Listening to the audience’s uproarious laughter at Keegan Theatre’s production last night, it’s not hard to see why this play is produced again and again – it’s simply guaranteed to make you laugh. There’s an endearing quality to Keegan’s performance, with the appropriately creaky Church Street Theater making a believable setting for a play about all the awful failures a tired touring company goes through. This may not be the most perfect production of this jewel of a farce, but the cast is giving it their all and there are crazy moments of hilarity. Playing now through August 22, it’s a very entertaining night out. Three acts take the audience through three nights of watching as a touring company attempts a farce called Nothing On, a silly piece of froth with a Benny Hill sensibility. The first act details the excruciatingly bad final dress rehearsal, an escalating battle between the actors – all in serious denial about the impending opening – and the director (Jim Jorgensen) prowling the audience taking notes with rising malaise at the hopelessness of anyone getting anything right. The second act takes place a month later on tour, as we watch the company perform the same scene but this time seeing the action from backstage, as internal arguments tear the company and the play to pieces. The third act swings the set back around to see yet another month’s jump with the same scene, both the play and the company hopelessly in hysterical shambles. By that third time, with everything so ridiculously wrong, you should be laughing to tears. 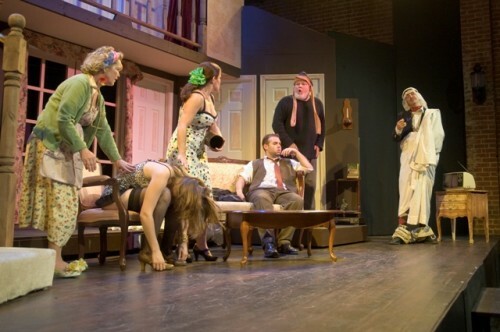 The trick of Noises Off is that the audience knows the play-within-a-play is doomed to fail before it’s even begun, as we recognize what the “luvvie” actors cannot – their blithe sense of self-indulgence stamps them second-rate. But in order for the trick to work, we have to find them endearing, not annoying, especially when all their kisses and compliments change into backstabbing catfights. Keegan definitely suceeds here, with the ensemble-playing-an-ensemble capturing all the foibles of actors taking themselves too seriously. What’s lost is the way Frayn rips into the specific “luvvie” culture of a certain tradition of British players in repertory theater, and that may be because the actors here at Keegan simply aren’t hitting the accents well enough. It’s my main quibble. There’s a lack of the hard viper wit of a brilliant British satire, and this is especially true in the first act. But the second and third act is where this cast and production shine, with their outrageous physical comedy (watch for that cactus! seriously a show-stealer) making up for any loss of a strong specific style in the first. The members of the ensemble are obviously having fun poking fun at actors being “actorly,” notably Brianna Letourneau as the sexpot ingenue forever posing and losing her contacts, Jon Townson as delicate Frederick Fellowes, always in need of a motivation, and Susan Marie Rhea’s practical Belinda Blair – that gossipy yet capable thesp invaluable on a tour falling apart. The play’s onion layers would fall apart without a strong hand directing, and Mark A. Rhea does a fine job keeping the movement flowing and the pace tight as actors fly on and off, up and down, navigating a labyrinth of doors and one dangerous staircase. It’s good fun, sweet really, and though I personally miss the specific sense of Britishness, with the physicality and pratfalls being so spot-on here that shouldn’t be dealbreaker. We all need a lighthearted frolic for a hot summer’s night. Note: Fellow WLDC author Patrick Pho is the stage manager for this production. That relationship had no influence on my review.